We’ve been in Bali almost six months now and have been to many different places for breakfast. Although there are still lots more to discover, I think I may have found Bali’s best coffee. (Kopi Bali is now in second place.) A friend (Kiki) had mentioned that she had really good coffee at the Corner Store a few months back so I decided to finally go to Seminyak and check it out. Arriving at around ten on a weekday, the place was packed with a young hip and happening crowd, typical of Seminyak. We sat at one of the few indoor tables inside the boutique (The Corner Store) which has a fun collection of children’s clothes, men’s swimwear and a small rack of assorted women’s clothing. Hip-hop music blasted from the speakers and the crowd looked like they needed a bit of a boost from the loud music as most looked like they had just woken up. The little cafe is called The Tuck Shop and has a three-page clipboard menu of breakfast items, salads, sandwiches and coffees. 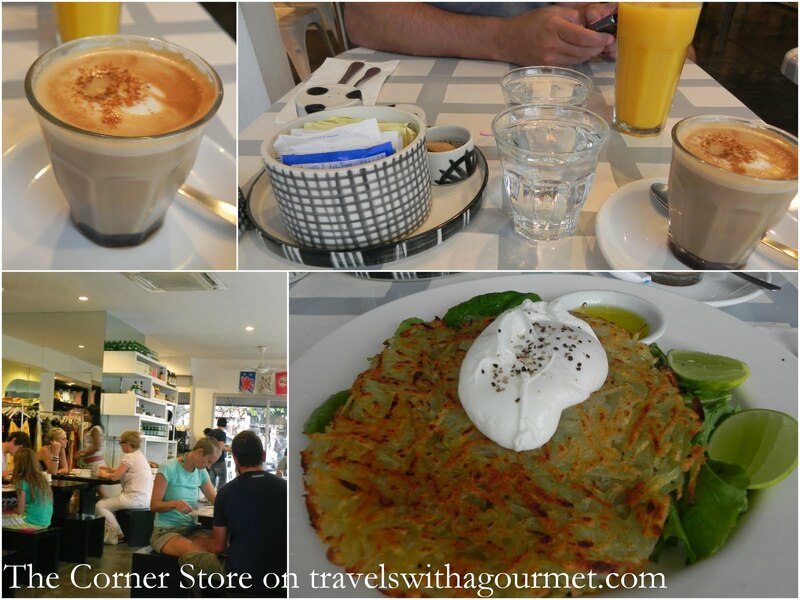 We ordered two very reasonably-priced flat whites (Aussie-speak for an espresso topped with hot milk, rather than foam which would be a cappuccino) at 15,000 Rupiah each, an orange juice and two specials – a poached egg on hash brown potatoes and arugula. The coffee arrived quickly and were very, very good. So good that we downed them quickly and had to order a two more even before our food was served. The breakfast was freshly-made shredded potatoes pan-fried to a crisp and served with a perfectly poached egg and bitter arugula greens. After breakfast, I browsed around the shop and ended up buying some cotton batik dresses for my little girl. We’ve been back for breakfast since and have also tried the smoked salmon bagel with cream cheese and green peppercorns which was delicious. We also had a nice bowl of muesli with yogurt and strawberries. As usual, the coffee was fantastic. If we didn’t live in Sanur, I would probably be having coffee at the Tuck Shop every morning. As it is, I’ll just have to try and get there once a week.